Mirimar in his Australian debut and Prince Of Arran are our two runners at Sale on Thursday. Mirimar (pictured) raced for the Ballymore Sterling Syndicate in England where he won over a mile and a quarter at Lingfield. The four-year-old has nor run since October last year and runs today in race eight, the Gippsland Middle Distance Series Heat over 1400m with Patrick Moloney to ride. “I didn’t want to give him a tough run first-up and flatten him so that’s why we have gone for the 1400m race,” Mike Moroney said. 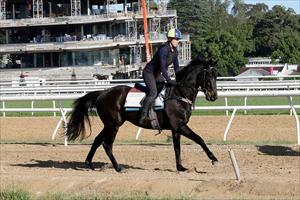 “He’s drawn nicely here and he does have some gate speed so he should put himself in the race. “The question for him will be if he can quicken up when the tempo lifts as he will be seen at his best at 2000 metres and beyond. Prince Of Arran has his third start this preparation in race nine, the Gippsland Middle Distance Series Heat over 1717m with Patrick Moloney to ride. “He’s drawn barrier one which might not be the best place by the last race of the day,” Moroney said. “I’m happy with him and we’ve put the blinkers back on him so the plane is to get away and then Patrick can make his way out.